Github integration allows you to host your repositories, see source commits and make code changes right from within Zoho BugTracker. So, now you can view all the changes made in your Github repository in Zoho BugTracker. 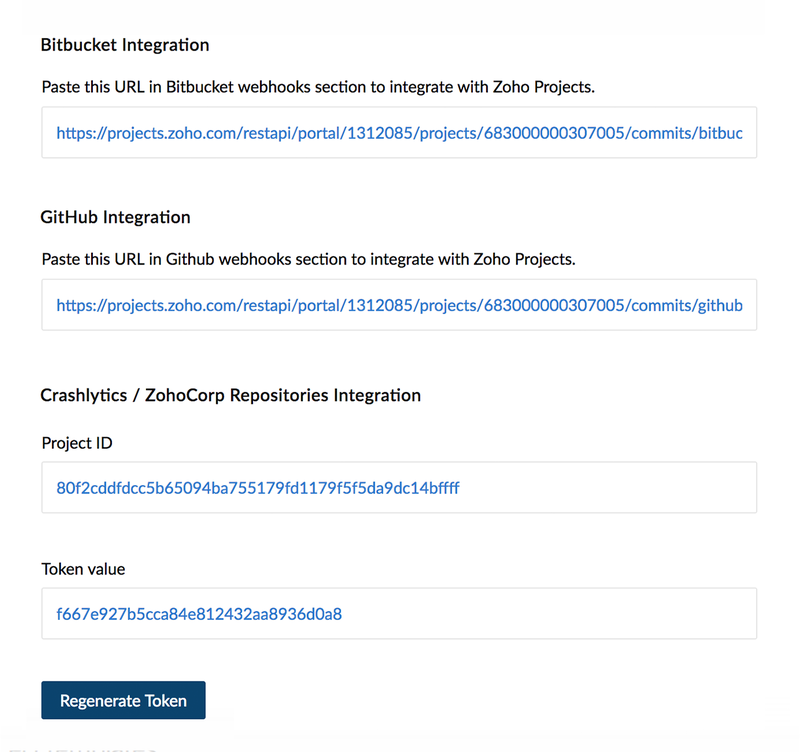 You must copy the Project ID and Token value in Zoho Projects to map the specific project with Github. Navigate to Setup > Integration > Developer Space > Service Hooks. Select a project and copy the Project ID and Token Value for GitHub integration. 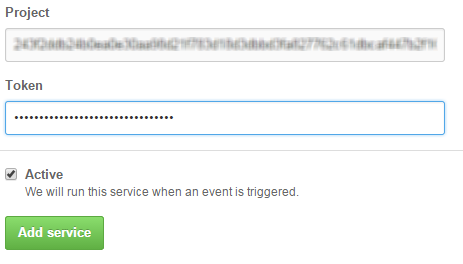 Log in to Github with your login credentials. Click Settings and then click Webhooks from the left panel. Copy the GitHub webhook from Bug Tracker and paste it under Payload URL in GitHub. Choose json format from the dropdown menu as the Content Type. 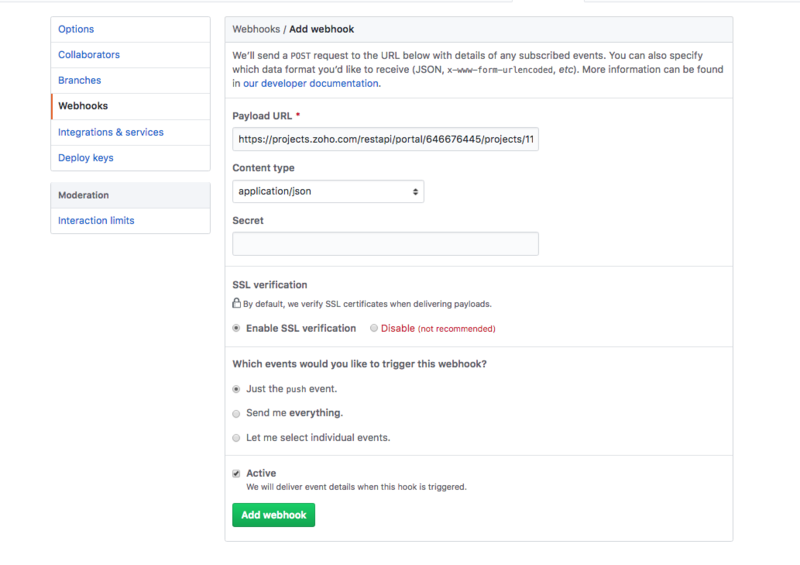 Note: Zoho Bug Tracker supports only Just the push event option for the webhook. 7. Click Add service to create a service hook for Zoho Projects in Github. Select the desired source file to edit. 4. Click Edit to modify the code as required. 5. In Commit changes modify the required details, if required. 6. Click Commit changes to save and submit the commit changes. In Projects, select the required project, and then click Bugs. In List view, click the desired bug to view the commit changes history. In Projects, select the required project, and click Bugs. And then click in the upper right corner and select Changesets from the displayed option, to view all the changesets for the project. Click the specific log message and view the file details at one glance. If you specify a bug ID while committing changes in Github, the commit message automatically gets linked to that particular bug in Zoho BugTracker. Syntax: OPEN SQUARE BRACKET #BUGID CLOSE SQUARE BRACKET followed by commit message. Example: [#EPI19] fixed the memory leak issue. This will associate the changeset for the bug with ID EPI19. To associate more than one bugs, provide the BUG IDs separated by a comma. Example: [#EPI19,#EPI20] changed the DB name.